And "White Christmas" and "I'll Be Home for Christmas" tied for second place in my last poll. I was surprised. I just knew "White Christmas" would win. Hmm. Me, I actually voted for "Jingle Bell Rock". I have another poll up and have my own prediction... but, well.... we'll see. In other news, I was incensed by an article about First Baptist Church, Dallas. Click HERE to read it. 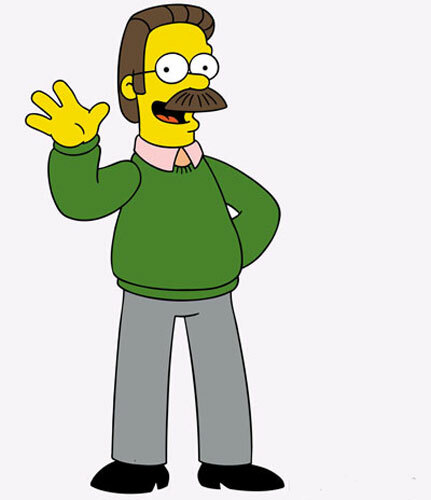 Then on "Fox and Friends" this morning they interviewed the pastor, and I looked at Sam and said, "He sounds - and looks a little - like Ned Flanders." I guess what I just wrote sounds like 'sour grapes'. I just think that this season Christians shouldn't declare war on ANYBODY, even if it's in jest. Mankind was (is) in a mess. God sent the Messiah ... in a totally unconventional way - in a stable .... and He grew up to save us from all awfulness ... in an unconventional way - by execution. And, ' course, the grand thing - the main thing - we celebrate at Easter, Christ's resurrection. Now THERE'S the victory. YES!!!! Sam's gonna have to move over if you keep this up, Nancy! LOL!!! Great post. I'm surprised at the last pol outcome too. I really thought one of the 2nd place songs would win. IT will be interesting to see how the movie poll goes. That's horrifying! I don't like it at all. I don't see any fun in that -- I see intolerance though. The first thing I thought of was the Jewish people who don't celebrate Christmas. Why should they be forced to acknowledge it if that's not what they believe? Mehhh, we are becoming more and more intolerant every day, and that scares me.